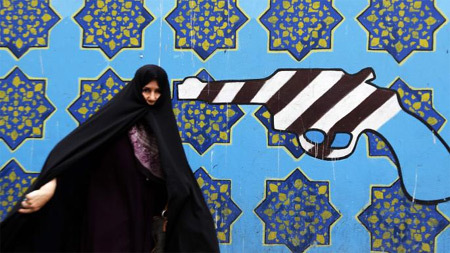 Donald Trump made the biggest foreign policy gamble of his presidency last night as he withdrew from the Iran nuclear deal and bet that Tehran could be pulled back to the negotiating table. 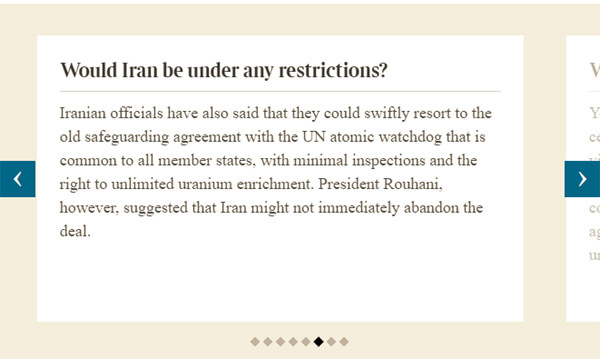 Promising “powerful new sanctions”, he offered a bold prediction on Tehran's likely reaction . 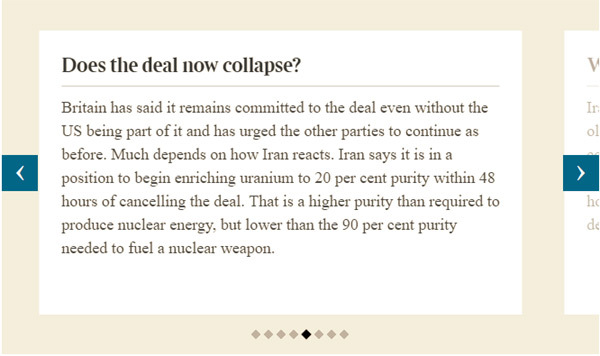 “The fact is, they are going to want to make a new and lasting deal, one that benefits all of Iran and the Iranian people,” he said. 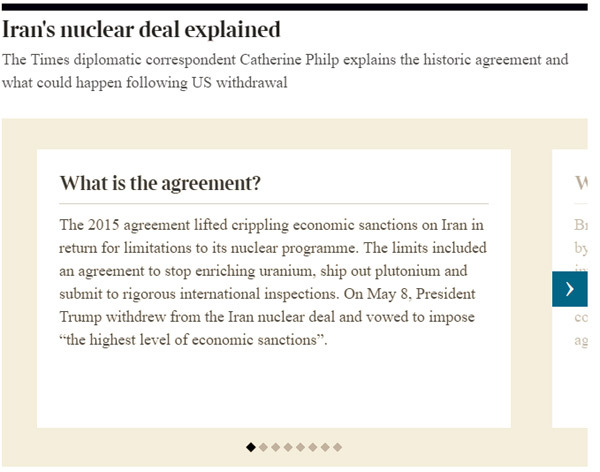 Under the 2015 pact Iran agreed to restrictions on its civilian nuclear programme in exchange for the lifting of a complex web of international sanctions that had been stitched together over the course of a decade. Yesterday he showed he had finally lost patience with the pact widely regarded as Mr Obama's most consequential diplomatic achievement. But as he sought yesterday to sever Iran from the global financial system he ran the risk of isolating himself from several key allies. 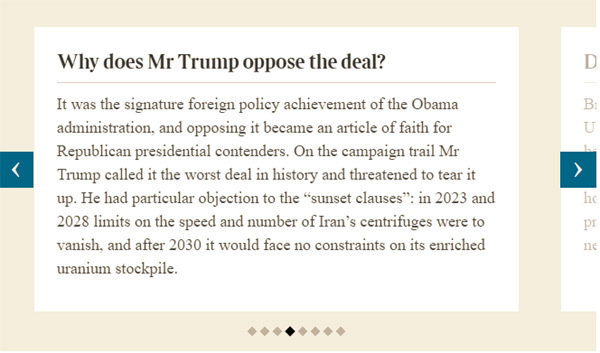 The other signatories to the Iran deal — China, Russia, Germany, France and Britain — had urged him not to weaken it. Angela Merkel, the German chancellor, and President Macron of France had both travelled to Washington last month in an effort to save the agreement. Boris Johnson, the foreign secretary, said during his own trip to the American capital this week that there was no credible “plan B”. Mr Trump's tough stance suggested that the influence of Jim Mattis, the US defence secretary who has defended the Iran deal, has waned since the recent appointment of two Iran hawks: Mike Pompeo, the secretary of state, and John Bolton, the national security adviser. 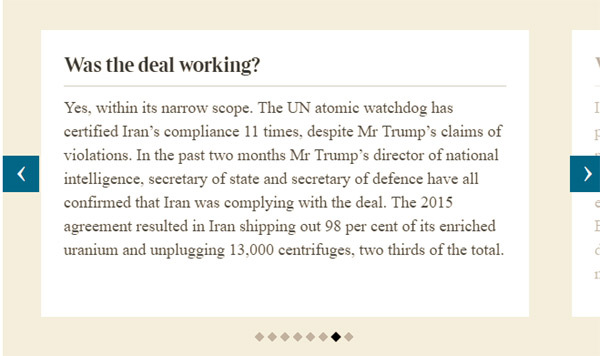 Mr Trump is expected to revive sanctions originally drafted by Congress in 2012 under the National Defence Authorisation Act designed to reduce exports of Iranian oil. Under US law he had to sign a waiver of those sanctions every 120 days, and the next deadline had been due this Saturday. 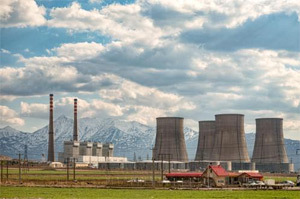 The act allows for foreign financial institutions that do business with Iran's Central Bank for the purpose of buying Iranian oil to be cut off from the US banking system. 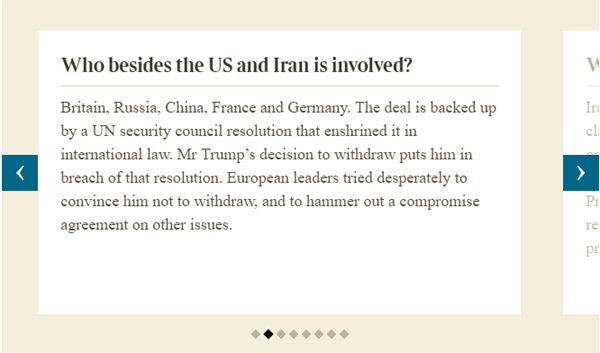 Aggressive enforcement would be likely to increase tensions between the US and its main trading partners, including the EU and China, who both argue that the Iran deal was working. Trade relationships with the EU have already been frayed by Mr Trump's threat to introduce protectionist tariffs on imported steel and aluminium. Between 2015 and 2017 European imports from Iran rose by nearly 800 per cent, mostly driven by oil. 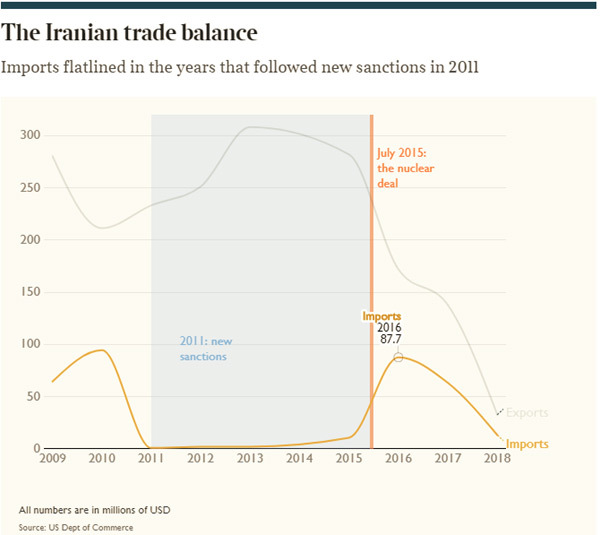 A separate set of US sanctions waivers were up for renewal on July 11, focusing on more than 400 Iranian companies, individuals and business sectors. Those measures are set to be revived later this year. Several countries are expected to resist US demands that they “wind down” their operations in Iran. Total, the French oil company, has announced plans to invest $1 billion in one of Iran's largest offshore gas fields. Late last year Russia unveiled plans to pour as much as $30 billion into Iran's oil and gas industries. China and India are now the biggest buyers of Iranian crude, and Airbus, the aerospace company, has a contract to sell Iran Air 100 planes, at a list price of more than $20 billion, although only three have so far been delivered. Experts have suggested that Iran will explore the option of trading in Chinese yuan-denominated crude oil futures on the Shanghai International Energy Exchange, skirting restrictions on dollar-denominated trade and US banks. 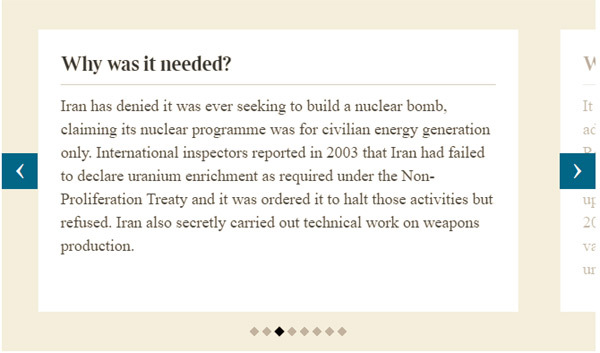 Previous sanctions, imposed in 2012, had cut Iran's oil exports in half and caused economic turmoil. A doubling of oil exports helped to lift economic growth to 12 per cent in 2016. Last year, however, the growth rate fell to 4 per cent while unemployment rose to record highs, according to Djavad Salehi-Isfahani, an analyst for the Brookings think tank in Washington. 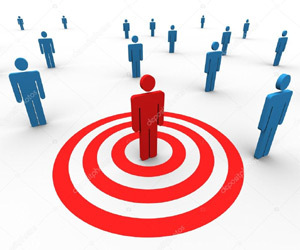 According to a 2016 census, among college-educated people aged 20 to 29, 36 per cent of men and 50 per cent of women are unemployed. Rhys Blakely , US Editor of The Times of London. Petroleumworld does not necessarily share these views. 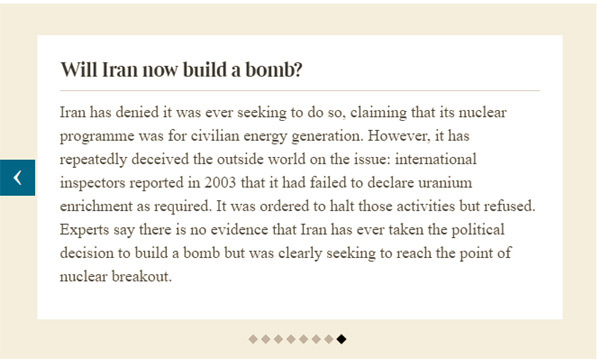 Editor's Note: This commentary was originally published by The Times on May 9, 2018. Petroleumworld reprint this article in the interest of our readers and does not necessarily reflect the opinion of Petroleumworld and its owners.